Attractiveness... it presents itself in such a way that those who find their way into it come to express themselves in ways consistent with the particular vision of ultimacy at the heart of this religious form. The Crusades - were very much holy wars waged to maintain Christianity's theological and social control- On their way to conquering the Holy Land from the Muslims by force of arms, the crusaders destroyed dozens of Jewish communities and killed thousands because the Jews would not accept the Christian faith. Jews had to be killed in the religious campaign because their very existence challenged the sole truth espoused by the Christian Church. The inquisitors generally saw themselves as educators helping people maintain correct beliefs by pointing out errors in knowledge and judgment. . . .Punishment and death came only to those who refused to admit their errors. . . .during the Spanish Inquisitions of the fifteenth century, the clear distinction between confession and innocence and remaining in error became muddled. . . .The investigators had to invent all sorts of techniques, including torture, to ascertain whether . . . new converts' beliefs were genuine. Egyptian Islamic Jihad to replace the government with an Islamic state that would reflect Qutb's ideas for Islamic revival. The Qutbist ideology has been influential in jihadist movements that seek to overthrow secular governments, and Qutb's books have been frequently been cited by Osama bin Laden and Anwar al-Awlaki. 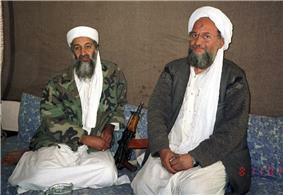 Since Osama bin Laden's fatwa in 1998, radical jihad has increasingly become an internationally recognized term. Bin Laden's concept, though, is very different from the actual meaning of the term. In the religious context, jihad most nearly means "working urgently for a certain godly objective, generally a positive one". The word jihad in Arabic means 'struggle'. The struggle can be a struggle of implementing the Islamic values in daily activities, a struggle with others to counter arguments against Islam, or self-defense when physically attacked because of belief in Islam. According to Steffen, there are portions of the Qur'an where military jihad is used. As Steffen says, though, "Jihad in these uses is always defensive. Not only does ‘jihad' not endorse acts of military aggression, but ‘jihad' is invoked in Qur'anic passages to indicate how uses of force are always subject to restraint and qualification". This kind of jihad differs greatly from the kind most commonly discussed today. ^ Ellens, J. Harold. p. 42–43. ^ Scott Shane, Souad Mekhennet, and Robert F. Worth (8 May 2010). "Imam’s Path From Condemning Terror to Preaching Jihad". The New York Times. Retrieved 13 May 2010.